Present day surround sound AV receivers have a come a long way from the stereo era; in fact, in the ongoing proliferation of ever-higher quality multi-channel surround formats, simple stereo receivers have become fairly rare birds. For many of us who still recall the days when 2 channels was the most you could hope for, the move to 7.1-channel AV receivers is something of a mixed blessing. Multi-channel surround can sound wonderful, of course, but choosing and operating a 5.1 or 7.1-channel AV receiver is inherently more intricate than 2-channel operation. Don’t get me wrong; I don’t advocate a return to stereo for the sake of simplicity. 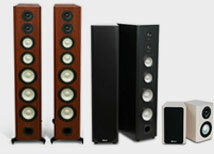 I’m a surround-sound enthusiast, whether for movie soundtracks, musical concerts, jazz, rock, or classical recordings. However, for consumers who don’t want to get involved with five to seven speakers plus a subwoofer, a simple stereo receiver is all they need. Two companies that make excellent stereo receivers with robust amplifiers that will drive even 4-ohm speakers like Axiom Audio's M80 floorstanding speakers without protest are Sherwood Newcastle and Harman/Kardon. That said, a “receiver” serves as a command center for either a basic audio system (a stereo receiver) or as an elaborate audio-video routing, switching, surround decoding and amplification center for a multi-source audio-video system (a 7.1 channel surround AV receiver). In both cases, the receiver will contain an AM-FM radio tuner (whether you want it or not) and either two internal amplifiers (stereo) or, most commonly, seven amplifiers, for 7.1-channel surround sound. Now that Dolby Digital 5.1 surround sound has become the standard for HDTV broadcasts and the vast majority of DVD and Blu-ray movie soundtracks, it makes sense to get an AV surround sound receiver, even if you just use it in stereo for a time. The increased realism of surround sound is very seductive, not just for movie watching but for all genres of music listening. It is, after all, the way we hear in real life, with sounds coming at us from every direction, and it makes acoustical sense to reproduce it that way. Moreover, a basic AV receiver costs little more than a stereo receiver and gets you a lot more versatility and listening options. Although some new AV receivers have connections for internet radio surfing and many are XM/Sirius satellite radio ready, a canny shopper must still consider basic output power for a given room and listening taste before going on to the more exotic features. Herewith is my guide to some of the most important questions you need to address in finding an AV receiver that will meet your needs and budget. It’s a receiver’s first duty to amplify the weak incoming audio signals to a level where they’ll drive loudspeakers to clean, reasonably high volume levels in most typical living rooms or home theaters without audible distortion (the latter produces harsh, edgy sound). The first thing to look for is the receiver’s rated per-channel output power into an 8-ohm load. (Most domestic speakers are either 8 ohms or 6 ohms impedance, which are essentially identical for purposes of power output). The biggest problem with the per-channel rating is that it is frequently only one channel driven, so that every added channel will reduce the per-channel output power e.g., “100 watts per channel” is actually 50 watts per channel with 2 channels driven and 14 watts per channel with 7 channels driven. This recent habit of taking the 100 watts per channel and multiplying it by 7 (“100 watts x 7”) to get the so-called “total power” is complete nonsense. 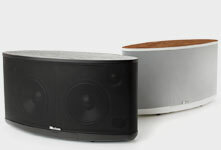 Axiom M80 Floorstanding Speakers in Maple Natural Wood Finish, powered by Sherwood 4-ohm compatible receiver. The only method to determine how much power an AV receiver truly generates is to separately measure the total watts produced by each channel, or to drive 5 channels simultaneously and measure the output of each. Some brands don’t weather that sort of stress and immediately shut down. Others manage it quite well, which points to a good, robust power supply section in the receiver. 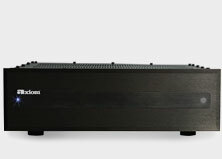 Bench tests of AV receivers by Sound&Vision magazine routinely do a 5-channels-driven test and, if you read the fine print in the test results or online, it will state how much power the receiver produces and whether or not the receiver shut down because of overheating or current limiting. In a perfect world, every manufacturer would state the power output of AV receivers with “all channels driven,” either five or seven, into 8-ohm loads, over the full musical range. The power output will often be significantly less than with one or two channels driven, but if you find all channels driven spec or measurement, take it as a positive sign of robust amplifier design. If you’re thinking about getting a pair of 4-ohm rated speakers like Axiom’s M80 v2s for your front main channels, check the same Sound&Vision test reports for the AV receiver’s output results into 4-ohm loads. Some brands will not drive 4-ohm speakers without overheating or shutting down. Others, such as Sherwood Newcastle, Denon, NAD, Harman/Kardon and Rotel, have no trouble with 4-ohm impedances. Look for the continuous power output with two channels driven into an 8-ohm load, over the full audio range of 20 Hz to 20 kHz (more often you’ll see the power output rated at a single frequency, 1 kHz) with total harmonic distortion (THD) of less than 1%, ideally 0.7% or lower. Distortion at that level is generally conceded to be inaudible with musical programming or soundtracks. Keep a close eye on the THD (distortion) ratings. Some manufacturers play fast and loose with power ratings, even specifying some packaged home theater in a box (HTIB) electronics at distortion levels as high as 10%, which will not only be audible but downright nasty sounding. To cover all but very large rooms and extremely high-volume playback, most people will be quite happy with AV receivers rated at between 70 and 130 watts per channel, with two channels driven. Although many AV receivers will deliver far less than that when all channels are driven simultaneously, it’s not a severe drawback. Even with the most raucous movie soundtracks, it would be extremely rare to ever find an AV receiver having to produce simultaneous output of 70 watts or 100 watts into each of its 5 or 7 channels. Typically, the surround channels demand far less power output (a few watts) than do the main left, center, and right channels, which carry the bulk of the acoustical output demands. Your AV receiver performs a source selection function, allowing you to choose which components (DVD, Blu-ray, cable- or satellite TV, CDs, videotape, iPod and MP3) to listen to and watch, so keep in mind how many audio/video sources you may want to connect now and in the future. That may include an aging VCR for all those older videotapes or perhaps even a turntable (that input is called Phono, and only some AV receivers have it) for that dusty vinyl collection you can’t quite bring yourself to unload. All receivers should have inputs for the full range of video connectors—composite, S-video, component video, and HDMI. With the popularity and standardization of HDMI, the clunkier DVI inputs have largely disappeared. If you have an older DVD upconverting player with only a DVI output, you can get a DVI/HDMI adaptor. With increasing price, the number and variety of inputs and outputs, especially HDMI, increases. The over-$1,000 models typically feature three or more HDMI inputs, and plenty of analog and digital inputs and outputs, both optical and (less commonly) coaxial. Entry-level AV receivers may offer only simple HDMI switching of connected components but you’ll want to make sure that whichever AV receiver you choose, the HDMI “version” is compatible with your HDTV’s input and with any upcoming purchase of HDMI-equipped components such as a Blu-ray player or gaming system. The latest HDMI version is 1.3, but earlier versions will carry many of the high-resolution audio formats. If you anticipate getting a separate power amplifier with much greater power output in the future, then make sure the AV receiver has “pre-outs” (preamplifier output jacks) for all channels. In most installations, your AV receiver will do much of the work of “decoding” the various new and older surround sound formats. There are now ten surround formats, Dolby Digital 5.1 being the standard of HDTV broadcasts and standard DVDs. The ten formats are: Dolby Digital (5.1), Dolby Digital EX, Dolby Digital Plus, Dolby TrueHD, DTS, DTS-ES, DTS-HD, DTS-HD Master Audio, Dolby Pro Logic II, Dolby Pro Logic II x. Additionally, you will find Logic7 on Harman/Kardon and Lexicon models. Classical music fans may appreciate the extra ambience, depth and expanded soundstage that Logic7 often imparts to good classical stereo recordings. Logic7 is comparable to Dolby Pro Logic II(x) or DTS Neo:6, all of which will take a 2-channel stereo source and synthesize center and surround channels to approximate 7.1-channel playback. The “important” surround formats on inexpensive AV receivers are Dolby Digital and Dolby Pro LogicII x, now almost universal on even entry-level models. You’ll also find various DTS codecs comparable to the Dolby Digital variations, which some enthusiasts like better for DTS’s somewhat exaggerated deep bass effects. If you want to have the latest high-resolution multi-channel audio formats—Dolby TrueHD, DTS-HD (Master Audio) and Dolby Digital Plus—common to Blu-ray high-definition discs, you’ll be looking at AV receivers in the upper price range. However, as Blu-ray and its associated hi-res soundtracks become more common, prices will fall. As of this writing (April 2008), Onkyo just announced an AV receiver (the TX-SR606) in the $500 price range that will decode Dolby TrueHD and DTS-HD (Master Audio) as well as having four HDMI 1.3a-compatible inputs. You can expect other brands to soon follow Onkyo’s lead. A lower-priced AV receiver (or an older model) lacking these capabilities doesn’t mean you can’t hear the newest soundtrack formats from a Blu-ray player. As long as any AV receiver has a multi-channel (usually eight) analog input set, then a Blu-ray player will do the decoding of Dolby TrueHD, DTS Master Audio or Dolby Digital Plus, and route the signals to the Blu-ray player’s analog 6 or 8-channel outputs. It just means a messier connection, with either six or eight analog RCA cables between the Blu-ray player and your AV receiver’s multi-channel input set. Make sure the AV receiver has a legible on-screen display so you can navigate the receiver’s settings during setup and calibration. Most AV receivers will have on-screen options for component-video outputs, but typically only more expensive models offer an on-screen display with the HDMI outputs. Even inexpensive AV receivers now have some type of auto-setup mode, with many including a supplied microphone and auto-calibration/equalization circuit (Audyssey is very common) that claims to adjust the frequency response of the system’s speakers to match the room’s characteristics. While the auto-setup modes are initially useful for first-timers, they are still prone to error, sometimes setting speakers that are small to “Large” and making errors in speaker level settings of 4 dB or more. You should still do a manual check using a sound-level meter and a pink-noise signal. Unless you have really poor speakers, I recommend you turn off the auto-EQ circuits. They may help smooth out the non-linear spikey frequency response of poorly designed speakers, but with really smooth linear speakers like Axioms, they often degrade sound quality. Remote control design is all over the map, and you often find a really desirable AV receiver with an annoying remote control that has illegible markings, lacks backlighting or uses tiny buttons all the same size. One can get used to almost any remote, but remotes with larger, different-shaped buttons, backlighting, and easily readable markings go a long way to making a remote control easy to use. Your new HDTV set will automatically do its own video processing, “scaling,” de-interlacing and trans-coding (convert) incoming video signals in order that they conform to your set’s specific fixed-pixel array (the latter is common to all plasma, LCD, and DLP displays). 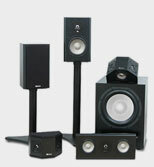 Many AV receivers also contain video processors that will perform similar functions. The question remains as to which unit — your AV receiver or DVD player or the HDTV—does a better job. It’s generally agreed that there should only be one conversion take place for maximum picture quality; adding more than one may degrade the video image and add various visible processing artifacts. In any case, be sure to set your HD cable-TV converter box (or satellite receiver) to output video at the native resolution of your HDTV display (720p or 1080i). If you have a 1080p display, try setting the cable box to either 720p or 1080i and see which produces the better picture. “Transcoding,” which is converting one signal format like S-video to another, say component video. “Deinterlacing,” which converts an interlaced video signal (480i or 1080i) to progressive-scan, e.g. 480i to 480p or 1080i to 1080p. “Scaling,” which alters the video signal from one resolution to another, like going from 480p to 720p. That’s it. For more detailed questions, send us an email or post your question to our Axiom forums, accessible on the Axiom home page, where many Axiom enthusiasts will help set you straight.